Training can be started at any age, the sooner the better. You can start simple training with your puppy as soon as he or she has settled into his/her new home. Older dogs are also receptive to training, although some may be less keen or quick to learn than a younger dog. Done properly, training should be fun, both for you and your dog, as well as exercising his brain and reinforcing the good relationship between you. In order to be effective and to gain the best results, all training should be based around positive rewards. Positive reward training works because if you reward your dog with something he wants as soon as he does what you ask, he is far more likely to do it again. Rewards can be anything that your dog or puppy really wants and could include; food treats, a favourite toy, playing a certain game or petting. However, really tasty treats will usually work best – try small pieces of dried liver, hotdog sausage, chicken or cheese for maximum effect. If you are using food treats, you will need to reduce the size of your dog’s normal meals or use his whole meal divided up into smaller portions, to prevent your dog putting on weight. Always combine the giving of a reward with verbal praise such as “Good dog”. When teaching a new command, you will need to reward your dog every time that he does what you ask correctly. Once he has the hang of the command, however, it is a good idea to change the way you reward by only giving the reward every now and then, because this will make your dog try harder for his reward. Always verbally praise your dog each time, even if he is not being rewarded with a treat. Punishment should never be used in training. If you punish your dog, it will only teach him to be scared of you and may eventually teach him to be aggressive. He will mistrust you and your relationship may break down. Avoid triggering the unwanted behaviour – avoidance prevents the unwanted behaviour from happening in the first place! Where unwanted behaviour cannot be ignored or avoided, train an alternative, acceptable behaviour for your dog to perform instead. It is much easier to train a dog to do something else that you don’t mind, than to train him to completely stop something that you do not like. For example, if your dog jumps up at people, teach him a really good ‘sit’ command and ask for this when meeting others. If he is rewarded with treats and attention every time he sits, he’ll soon automatically be doing this when he meets people, instead of jumping up! Sit, down, stay, come and walking nicely on the lead. This is our guide to training in a kind and effective way. command “sit”. His head should go up as he tries to reach the treat………………. …………….and his bottom should go down into the ‘sit’ position. Give him the treat and praise him. Do not push his bottom down to make him sit, as he is likely to push up against your hand as a result and may hurt his back. When training your dog to sit, use the command “sit”. Do not use “sit down” as this may confuse your dog when you try to teach the ‘down’ command. Ask your dog to sit and show him the treat in your hand. Slowly move your hand down towards the ground in front of him (just in front of his feet), as you use the command “down”. He should follow your hand with his nose and lay down. Give him the treat and praise. If you have trouble getting him to lie down in this way, put an object such as a coffee table or a chair between you and your dog and try again. He will have to lie down to get under the barrier to get the treat. Remove the barrier when he gets the hang of it. Do not push or force his back down as he will push against you and may hurt his back. With his lead on for extra control, make him sit or lay down. …..step back to him, treat and praise. If he gets up, ask him to sit again and repeat the procedure. After a few successful sessions, drop the lead before stepping away. If he is doing this short ‘stay’ correctly, gradually increase the distance between you and your dog and/or the time that he is asked to stay. If he gets up when he is not supposed to, go back a stage to a shorter distance or time and then increase again slowly until he is doing as he is told every time. When you are confident that your dog will reliably stay during training, you can progress to unclipping his lead before stepping away. Practice in your home and garden first as there are fewer distractions for your dog than in the street. Choose which side you would like your dog to walk on and then stick to it. Hold the lead in the opposite hand – keep it loose (if it is too tight, your dog will pull into it) – and put a treat in the hand nearest your dog. Show your dog the treat and walk forwards. As he follows your hand, say “heel” and give him a small bit of the treat. Keep some treat in your hand and keep going. As he keeps to your side, say “heel” and give him some more treat. Don’t stop walking. If he doesn’t keep up with you, or pulls in a different direction, suddenly change direction and encourage him to come with you. Praise him when he catches up and give him some treat. He’ll soon get the idea. It is a natural, enjoyable behaviour for a dog to want to find out what is happening in his local area by sniffing the ground, lampposts and fences for scents left by other dogs. On walks you should allow him to have a sniff around, but only when you say so and not when he feels like it. When you are ready to let him do this, use a command such as “off you go”, so that he can learn when he is allowed to do this. You could use this loose lead ‘freedom’ as a reward for when he has been performing well on the lead. All dogs need a good run off-lead in a safe place at least once a day to help them stay happy and fit and to get rid of some of that excess energy that can lead to mischief making. However, it is an owner’s legal responsibility to ensure that their dog is under control at all times in a public place – so being able to get your dog to come back to you when you call him is very important. Step one – introducing the basic idea that coming to you is a good thing! Feed your dog normally (preferably at least twice a day) – if you are worried that your dog may be overweight, reduce the size of his main meals slightly during the training period. Never train him when he is hungry, as this can make him frustrated and it’ll be difficult for him to concentrate. Find treats that he really likes – try small pieces of liver, chicken, hotdog sausage or cheese. Keep a pot of these in the fridge, so that you have access to treats at any time of the day. Pop some treats in your pocket and at random times when you are in the same room together, call him to you in a happy voice and give him a treat. After he has finished his treat, say something like “good dog – off you go!”. Repeat this frequently during the day, for a few days, until he is coming to you quickly every time. If you have been using “come” as a command up till now without success, then this may be a good time to change it. Try “here” or perhaps even a whistle which can be easier for a dog to hear when out on the park. Once you choose a new command you must stick to it, or you’ll confuse your dog and he may never learn what you really want him to do. Even though your dog may already be happy to come when you call him in the home, you still need to do this initial bit of training and turn it into a great game for your dog. Skipping a stage may affect the rest of the training. For now, walk your dog on a long or extending lead. If you punish him in any way for not coming to you on a walk during this early training time, it may undo all the good work. Now it gets even more fun for your dog. Do exactly the same as in stage one, but start calling him from another room or part of the house. When he is coming every time, start calling him from the garden as well. Your dog should be having great fun by now trying to find you when you call him. Do this for a week and if he is coming every time as soon as you call, you can move onto the next stage. Stage three – keep him guessing and he’ll try even harder! Change the type of treat from time to time and sometimes give him a larger amount than usual as a big ‘jackpot’. Other times play a game with his favourite toy when he reaches you or just give him lots and lots of praise and cuddles. If you change the reward every time that you call him, this will actually make him try harder to get it right – just in case he hits the ‘jackpot’ i.e. the treat, game or fuss that he wants the most. Strangely enough it has the same effect as gambling has on humans! You can use this with training any command – not just the recall. When your dog understands exactly what the recall command means he should respond to it at speed, every time you use it. Now try it outside in public places. Make it easy for yourself and your dog by finding an area that is as quiet as possible. If other dogs are running around it will be very hard for your dog to concentrate. It is absolutely important that your dog gets the command right every time at this point and then you can slowly build up to higher levels of distractions but only as long as your dog keeps getting it right. Remember to feed your dog 45 minutes to an hour before training on walks. 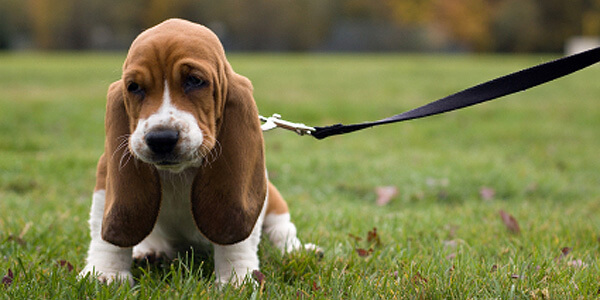 Keep your dog on the extending lead or long line, so that he cannot get away or out of sight. Let him go to the end of the lead and enjoy sniffing around. When you are ready, call him to you and wait. Do not pull him to you – he must come to you out of choice. When he does, give him his reward, praise, then “good dog – off you go!” and let him go off sniffing again. Repeat this several times during his walk, so that he learns that coming to you will not automatically mean it is the end of his walk. You will need to do this outdoors training for around two weeks and if possible, try to do it in different locations – i.e. the park, a friend’s garden, a different park from usual, the woods, a country park etc. This will help your dog to learn to come to you wherever you are in the future, otherwise he may assume that he only has to come in the one place that you’ve done the training with him. Never tell your dog off if he doesn’t come to you on command. If your dog thinks that you are going to punish him when he does eventually come to you, he won’t want to come to you at all. Always praise him for coming to you, no matter how long it has taken him. When your dog is coming to you every time when called on the long line, you can try letting him off the lead completely. The first time that you do this, try to make sure that it is in a quiet area, so that he doesn’t completely forget his training at the first sight of another dog. Again, build up the level of distractions slowly, so that you can make sure he sticks to his training. If you are not careful, he could quickly go back to old habits. Do let him have a little play with other dogs if he is friendly with them. Call him back after a few minutes; he should come to you if you have trained him well. Once you are confident he knows his recall command, you can start to gradually reduce the treats – but remember to praise him every time and make sure that he is never walked when he is hungry. Try to have fun with your dog on your walks by taking his favourite toys and playing games, getting him to come to you and then letting him go again to play. If you keep his interest with enjoyable games, he won’t want to run off in the first place. Walks are one of your dog’s daily highlights – involve yourself actively and your dog will want to be with you. Reward or treat him on a random basis, once the new command has been learnt – but still remembering to verbally praise every time. Try to finish on a high note – your dog is more likely to want to train again next time! If things aren’t going well and/or you feel that you need more support, you should consider going to an organised training club. Having the resources of a trainer and classmates can be very useful, with the added benefit of being able to socialise your dog and teach him how to interact with other dogs under controlled, ‘safe’ conditions. From puppy classes to competitive obedience or flyball, there is a class out there to suit both you and your dog’s needs and interests. Not allow shouting at dogs or handlers – it is supposed to be fun!